With a smartphone like the Android based devices a lot of programs continue running in the background, even when the screen is off. Email and calendar sync, Google Latitude, etc. So it is important to be able to kill the data connections for these services when they are not needed, to save battery power and money. Of course you could just use flight mode, but that really defeats the purpose of a phone, doesn’t it. 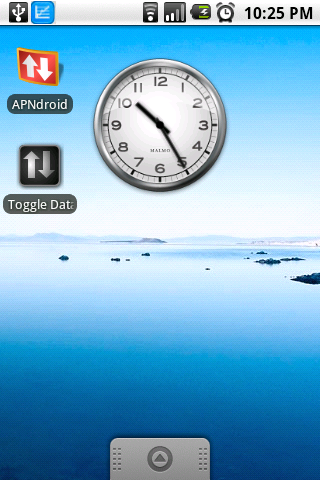 The two apps under consideration are APNdroid and Toggle Data. Both are free from the Android Market. APNdroid works by changing the name of your APN entries, invalidating them, making cellular data connections unavailable. The interface is an app which you can place as a shortcut on your home screen. Run the app once it disables the connection and places a message in your notification. Run it a second time and it enables the connection again. Toggle Data is similar in interface, again with an app shortcut, but using a toast, or on screen message to indicate enabled or disabled. Also, Toggle Data does uses an alternative approach to disabling the data connection, perhaps the same as the flight mode does? With both apps you need to make sure you enable your data connection again before removing them, else you might be in a little bit of trouble.